According to the World Health Organization, approximately 1.1 billion people around the world don’t have access to clean water (Folia Water). Dr. Theresa Dankovich and her company Folia Water have created a drinkable book that allows the creation of clean water. Dr. Dankovich has a “B.S. in fiber science from Cornell University’s School of Human Ecology, an M.S. in agricultural and environmental chemistry from University of California, Davis, a Ph.D. in chemistry from McGill University, and postdocs at the Center for Global Health and civil and environmental engineering at University of Virginia and civil and environmental engineering at Carnegie Mellon University” (Folia Water). At first glance, it is a normal looking book, with information about good health, sanitation, and clean water, but the pages themselves are actually water filters containing silver nanoparticles that kill bacteria. In order to use this paper, you place the page into a plastic filter box and pour the water over it. It is affordable for people living off less than $2 a day, because it only costs a few pennies to produce. There are approximately 1 billion people in the world that live on less than $2 a day (Folia Water). This company’s main goal is “to promote human welfare by using technological innovation to reduce the incidence of waterborne disease” (Folia Water). Access to clean water is a basic human right that many around the world don’t have. Because of this, 2.6 billion people lack access to basic sanitation, leading to many different diseases like dysentery, which have the potential to kill many. According to UNICEF, Waterborne illnesses kill around 1,000 children every single day (Folia Water). These numbers are truly frightening, and we can fight to decrease them. 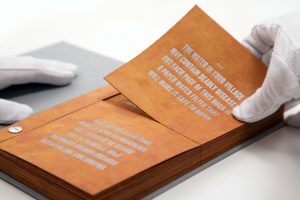 An entire page of the Drinkable Book can filter water for up to a month for one person, therefore, an entire book can filter drinking water for about a year. The combination of this new technology and scientific innovation, with the affordable price, will surely decrease the amount of Waterborne illness and give everyone access to clean water. After testing this product in Honduras the water showed 100% inactivation of E.coli bacteria. To back this up, these filters do meet US EPA guidelines for bacteria removal to produce safe drinking water. They have also tested the product in Bangladesh, South Africa, Ghana, Haiti, and Kenya. There are still obvious concerns with the product; how well does the water filter, do the pages actually last as long as one year, how do the pages not get clogged and filled with E.coli after continuous use, how quickly do the pages filter, and many more. Regardless of these questions, Folia Water is doing everything in their power to give everyone around the world access to clean water. This company is showing tremendous CSR, making it their main mission to benefit and serve the greater public. Even though the company is For-Profit, it is still affordable for the vast majority of people currently in a deficit. The company’s next steps include creating a better paper for filtering, running more tests, and making the information printed on the pages available to people of all cultures and literacy levels. Folia Water is making great strides in making sure everyone is included into every aspect of this new invention, they don’t plan on leaving anyone behind.